Boombet is no longer endorsed by BettingPlanet.com because of untrustworthy practices involving payouts. We strongly recommend playing at House Of Jack Casino or visiting our online casinos page to find another site accepting players from your country. Boombet Casino opened its virtual doors late November 2016, flying on the coattails of the success of sister-site, Crazy Winners Casino. Following a similar format to Crazy Winners, Boombet offers a large selection of browser based slots, table games and instant-win games from leading software studios like BetSoft and Microgaming. The site has taken some unique approaches that will be favoured by seasoned online players who are used to the same old same old, with features like the Boombet Store giving you the chance to buy discounted spins and more. What kind of players is Boombet suited to? Boombet offers an in-your-face casino full of lively animation that is suited to younger, or young at heart, players. The casino caters to multiple languages, including English, Deutsch, French, Spanish, Norwegian, Swedish and Finnish, accepting only USD, GBP and Euro currencies. It’s an instant-play site powered using Flash software, making it ideal for players who want to steer clear of any downloads. Games are available for free in practice mode, as well as for real money bets. While the casino offers a huge variety of slots, table games and scratch cards, there are no live dealer casino games on offer. Boombet offers some great bonuses and promos, but be wary of the fine print, as there are some sneaky terms and conditions that ensure these bonuses aren’t as lucrative as they first seem. No deposit bonus – Boombet rewards new players straight off the bat, awarding 20 free spins with no deposit required. Just register for an account and you’ll get 20 free spins to use on popular slot game, At the Copa. While this is an excellent welcome bonus, the major bummer is that it comes with a gigantic 70X wagering requirement – one of the highest wagering requirements we’ve ever seen from an online casino. That means players must play-through the amount of their bonus 70 times before being able to cash out any winnings made from it. Not cool! Your bonus money is also only eligible for play on the slots and scratch cards, you can’t use it to play any of the table games, progressive jackpots slots or video poker games. Weekly Cashback – If you spend $500 or more during each Cashback Week (beginning every Thursday) you’ll be eligible for a Weekly Cashback bonus where you can claim 10% back on all your losses. To receive this bonus, your account will need to be sitting at $5 or less, so you’ll have to well and truly have lost it all to benefit from this bonus. Boombet Store – The Boombet Store is a major drawcard for this venue offering a fun and fresh way for players to purchase heavily discounted spins on specified slot games. The beauty of this is that you have the power to choose exactly what games you want to play, and the value of each spin. 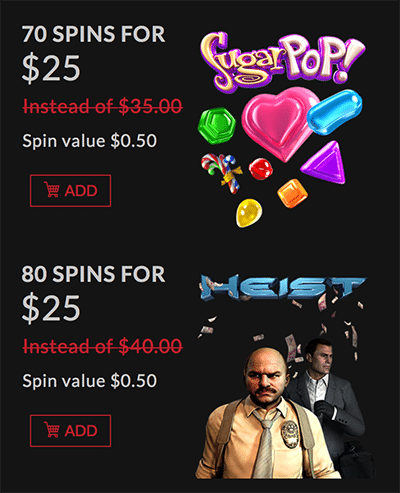 For example, you can purchase 140 spins on Sugarpop with a spin value of $0.50, for a total of $55, instead of the full price of $70. Boombet offers a large collection of real money slots, blackjack, roulette, instant win scratchies, table games and other fun lotto/number games from leading software developers like BetSoft, Microgaming, Rival, NetEnt, Pariplay, Sandstorm Vivo Gaming. While the selection of slots and table games is impressive, where Boombet really shines is in its offering of scratch cards and instant win mini-games, offering a large array of games you won’t find at any of our other recommended casinos. There’s also several keno, lotto, bingo and number games to appeal to the recreational players who are looking for something a little different. The table games haven’t been broken down into sub-categories, so you’ll need to manually filter through the 167+ titles on offer to find the variant you’re looking for, while a search function also exists if you know the title of the game you want. Boombet does not yet offer a mobile casino site, which is rare for our online casinos, and is a big thumbs down. Given the popularity of mobile play, we assume it’s only a short matter of time before the Boombet mobile casino goes live. All payments are Boombet.com are protected by 128 Bit Digital SSL Encryption, the same level of sophisticated online security technology used by all major banks and websites. The payment options available to you will depend on the country you’re playing from. To check which options are available in your chosen currency, sign in at Boombet and head to the cashier section in the casino lobby for a full list of your choices. All withdrawals are processed within 48 hours of being requested. If you make more than one cash-out request using the same payment method within 24 hours, your withdrawal may be combined into one payment. Boombet is licensed and regulated by the Curacao e-Gaming Commission, one of the leading online gambling jurisdictions in the world. As a brand new casino, Boombet will need time to establish its credibility within the industry. However, it’s part of the CyberRock Entertainment N.V Company, which is part of the esteemed DrivenAffiliates group of casinos, which speaks magnitudes for its reputability. With these names behind it, you can rest assured that Boombet is a safe, legit and trustworthy casino run by experienced people who know the online gambling industry inside and out. Boombet has a zero-tolerance policy on fraudulent activity and may at any time request such documentation from you as a photocopy of your current ID, a photocopy of each credit card you use for your casino deposits and a signed credit card authorisation. These procedures are intended to strengthen the security of all electronic transactions made through the site and is a standard request for online casino vendors. Boombet has also developed its own internal Anti-Money Laundering and Counter-Terrorism Program (the AML) to ensure that all players are compliant with the Anti-Money Laundering & Countering Financing of Terrorism Act 2009. Along with its SSL (Secure Socket Layer) certificate, Boombet also provides an extra layer of security with the use of Sentinel Risk software. There are several immediate downsides to Boombet. The first being is it only accepts deposits in USD, GBP and Euros. While this will be great news to many players, it’s disappointing to see local currencies like AUD, NZD, SEK, NOK and JPY missing out. In fact, Asian players as a whole are left in the dark here, with no Asian currencies or languages catered to. Another red flag we found when filtering through Boombet’s terms and conditions is that the casino is entitled to any of your money if you haven’t logged into your account within 90 days. We think three months is a pretty short amount of time before the casino can claim rights to any of your unused cash and this is a pretty shifty little move. Boombet’s welcome bonus also comes with one of the largest wagering requirements we’ve ever seen from an online casino, with players required to play-through the giant amount of 70X any bonus money before winnings from any bonus credits can be withdrawn. For scale, the average wagering requirement for an online casino is around 35-40X. As of its launch in November 2016, Boombet has no mobile casino to speak of. Disappointing terms and conditions aside, Boombet’s casino is pretty solid, offering a range of real money games from some of the best software providers in the business. The layout is different from most, but in a refreshing way, and we like the venue’s unique use of game icons. The selection of scratchies and instant-win games far exceeds any of our other recommended casinos, and with over 160+ table games, Boombet gets a big two thumbs up in that department. The real standout feature of Boombet is the innovative Boombet Store, which will be particularly attractive for slot fanatics. However, if you’re not a slot fan, your money might be better spent elsewhere, where you’re not restricted by the requirements outlined above. Boombet offers a 24/7 live chat option, with customer service employees on standby to assist with any queries you may have, so feel free to hit up the team if you have any further questions regarding any of the Boombet bonus offers, games or payment options. Sign up for a new account at Boombet Casino to receive 20 free spins, with no deposit required, followed by a 200% matched deposit bonus and 200 extra free spins when depositing real money for the first time.